In a few days (February 4) yet another “relationship” book will hit the bookshelves – and most probably the bestseller lists, considering the massive PR work that’s been done around it. Its “enticing” title is Marry Him: The case of settling for Mr Good enough. 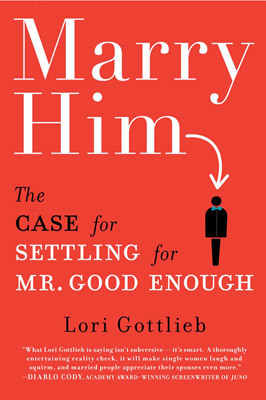 In it, author Lori Gottlieb advocates that single women over 30 should stop looking for ‘Mr Right’ and instead marry the first ‘Mr Second best’ who comes along. If not, they’ll end up unmarried and childless at 40 – which would be terrible because as Gottlieb states: “In reality, we aren’t fish who can do without a bicycle, we’re women who want a traditional family”. 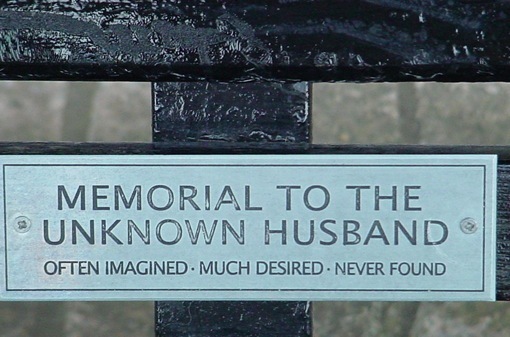 The “theory” about women having difficulties getting married once they’ve passed 30 is far from new and often goes hand in hand with statistics that are just as ancient. A 24-year old article from Newsweek stating that professional women over 30 only have a 20% chance of walking down the aisle (and women over 40 years a 2,6% chance) is still being actively, and wrongly, referred to today. But let’s look away from that fact that Gottlieb is stuck in another era. There seems no need either to emphasize that all women do in fact not want to get married at all. Let’s concentrate instead on the “settling for second best” business. Contrary to Gottlieb, I think that women learn very early on that the “perfect man” (as depicted in various movies, be it in the role of a father or a lover) does not exist. Sure, many of us may dream of getting swept off our feet by some kind of Richard Gere / George Clooney / Luke Wilson (my personal favourite), but do we actually believe it’s going to happen in true life? I don’t think so. We do however often fall in love with – and marry – men who are not Mr Perfect – at least in our friend’s and family’s eyes. I for one don’t consider any of the men my friends married as ‘Mr Rights’. In fact, I wouldn’t “settle” for any of them, not even at 40. And this despite none of them having bad breath or a questionable sense of style. As for the men I’ve been involved with, well I don’t think my parents or friends ever thought of any of them as Prince Charming. The thing is though, when you fall in love, the object of your affection becomes “perfect” even if he, like every person, has many flaws. It’s not like you actually believe that the imperfections don’t exist, it’s just that you don’t care about them. And that’s a good thing. Because by the time these flaws do become apparent and irritating (and they nearly always do), your relationship should be strong enough to live with them. Considering the work it is to be – and to stay – married, there is no meaning in “settling” for someone. It’s unfair on yourself and on the person you’re marrying. On your wedding day, you should be totally and head over heels in love. It’s a minimum requirement. (This might be easier if you don’t spend a year planning your wedding or live together for a decade before actually getting wed). I have not read a “relationship” book since “Men are from Mars, Women are from Venus” came out. I think the sexist, prehistoric views it promoted put me off that kind of literature forever. I will therefore not be reading Gottlieb’s seemingly just as archaic and damaging book. I don’t buy her “women are too picky” theory. (In fact, I often think women aren’t picky enough). And I don’t support the “go for Mr Good enough” option. It’s degrading for both sexes. I believe a woman can have everything she wants – love and children included – without getting married. I believe that “settling” for someone will not provide happiness or a good home to raise your offspring. Most importantly, I believe authors, women and the rest of society should stop viewing marriage as a life achievement award for the female gender. Because why on earth should women settle for that?